The William Blake Archive is pleased to announce the publication of the electronic edition of Europe a Prophecy Copy D, from the British Museum. Europe, extant in nine copies, is dated 1794 on its title plate. The first six copies were color printed that year; four of these copies were printed on both sides of the leaves and two were printed on one side only. Copy D belongs to the former issue and joins in the Archive Copies E and G from the same issue and Copy B, more heavily color printed, from the latter. It also joins Copy H, the only monochrome copy printed by Blake, produced in 1795, and Copy K, from the last printing session, c. 1821. With each printing session represented in the Archive, users can trace the full printing history of Europe. A unique feature of Europe Copy D is the pen and ink inscriptions in the hand of Blake’s friend George Cumberland. 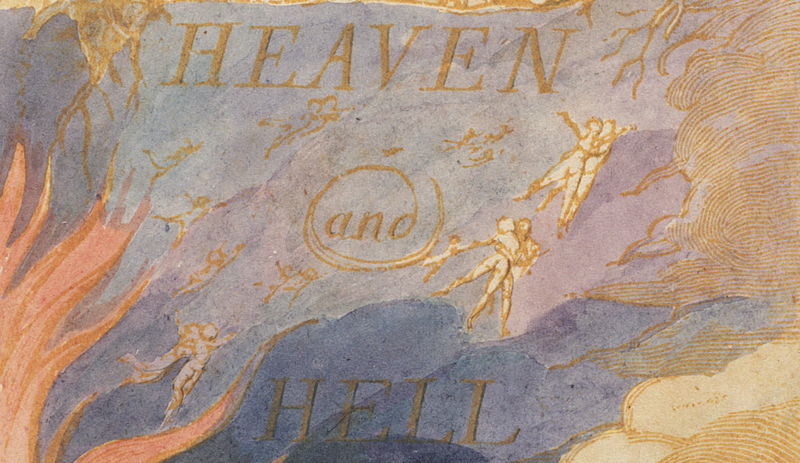 These are quotations from a number of literary works, apparently added as glosses on the designs, and constitute one of the few contemporary responses to the pictorial images in Blake’s illuminated books. Ozias Humphry, the first owner of copy D, apparently lent the volume to Cumberland, who copied most of the inscriptions from Edward Bysshe’s Art of English Poetry. With our “Related Works in the Archive” feature in the Show Me menu on the object view pages, users can access the untrimmed sheets with their marginal inscriptions and close ups of each inscription. Blake also executed for Humphry the Large and Small Book of Designs in 1796, published in the Archive in February 2012. Like all the illuminated books in the Archive, the text and images of Europe Copy D are fully searchable and are supported by our Virtual Lightbox and ImageSizer applications. With the Archive’s Compare feature, users can easily juxtapose multiple impressions of any plate across the different copies of this or any of the other illuminated books, and with the Lightbox, users can examine images from any of the works side by side, as well as crop, zoom, and juxtapose them for close study. New protocols for transcriptions, which produce improved accuracy and fuller documentation in editors’ notes, have been applied to Copy D and to all the Europe texts previously published. With the publication of Europe Copy D the Archive now contains fully searchable and scalable electronic editions of 81 copies of Blake’s nineteen illuminated books in the context of full bibliographic information about each work, careful diplomatic transcriptions of all texts, detailed descriptions of all images, and extensive bibliographies. In addition to illuminated books, the Archive contains many important manuscripts and series of engravings, color printed drawings, tempera paintings, and water color drawings.